Long Beach Expo Offers Look at PCGS-Certified Pogue's 1822 & 1854-S Half Eagles & Dexter 1804 Dollar! 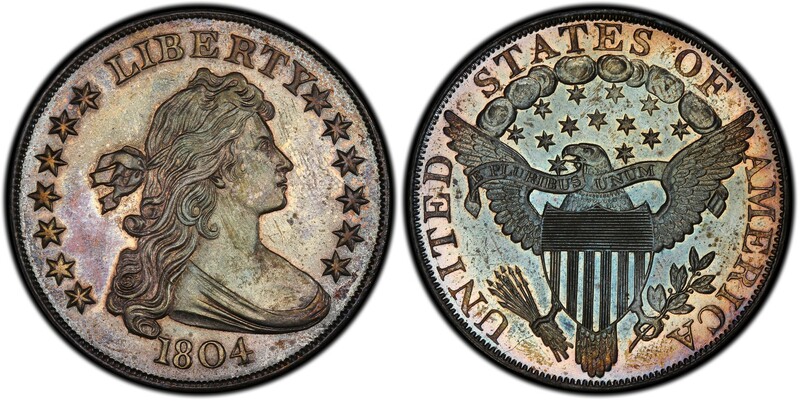 The Pogue Family Collection 1822 Half Eagle, graded PCGS Secure AU50. (Long Beach, California) -- Three numismatic national treasures from the eagerly-anticipated D. Brent Pogue Family Collection, the 1822 and 1854-S Half Eagles and the Dexter 1804 dollar, will make their West Coast debut at the Long Beach Coin, Currency, Stamp & Sports Collectible Expo (www.LongBeachExpo.com), January 29 - 31, 2015. The historic coins will be among the PCGS-certified Pogue Family Collection items displayed by Stack's Bowers Galleries at their booth (#502) during the three-day show. Stack's Bowers and Sotheby's will jointly offer the collection in a series of auctions starting in May. 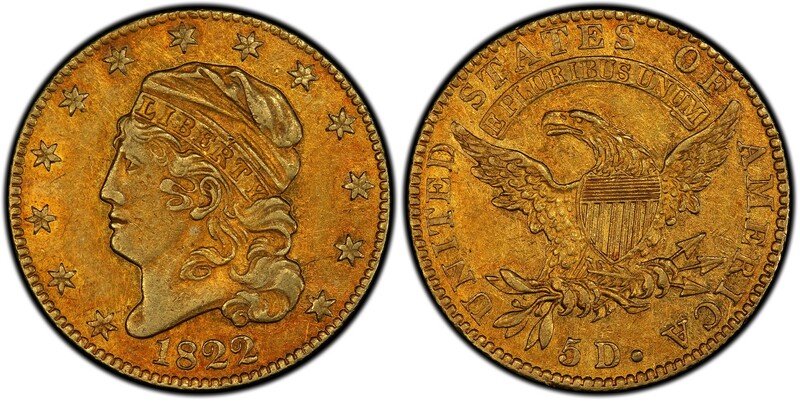 "The 1822 Capped Bust Half Eagle is one of the greatest numismatic treasures of the United States," stated David Hall, Co-Founder of Professional Coin Grading Service (www.PCGS.com). 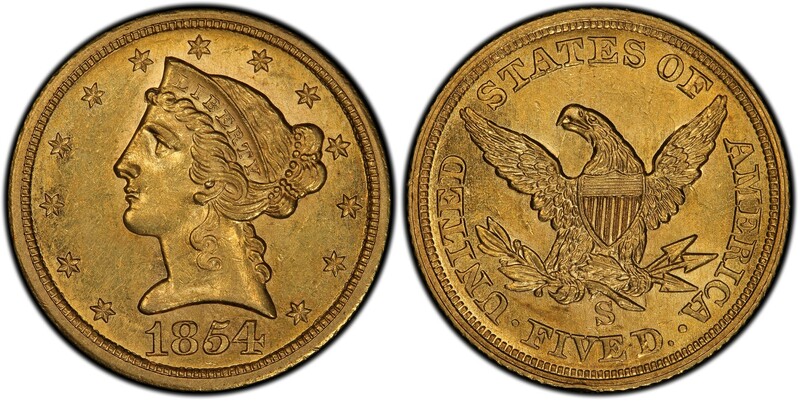 Graded PCGS Secure AU58+, the 1854-S Half Eagle is another treasure from the Pogue Family Collection. "United States Mint records indicate that 17,796 $5 gold coins were produced in 1822, but today only three survivors are known. Two of them are part of National Numismatic Collection in the Smithsonian's National Museum of American History," explained PCGS President Don Willis. "The Pogue coin is the finest of the three, and is graded PCGS Secure™ AU50." Legendary collector and Baltimore, Maryland banker and financier, Louis E. Eliasberg Sr. purchased the coin from dealer Abe Kosoff for $14,000 in 1945. Pogue bought it for $687,500 in 1982 at "The United States Gold Coin Collection" auction of Eliasberg coins conducted by Bowers and Merena (now Stack's Bowers). The Dexter specimen 1804 Class I Draped Bust dollar in the Pogue Family Collection is graded PCGS Secure PR65. There also are only three known 1854-S Coronet Head Half Eagles, and one of them is part of the Smithsonian's holdings. 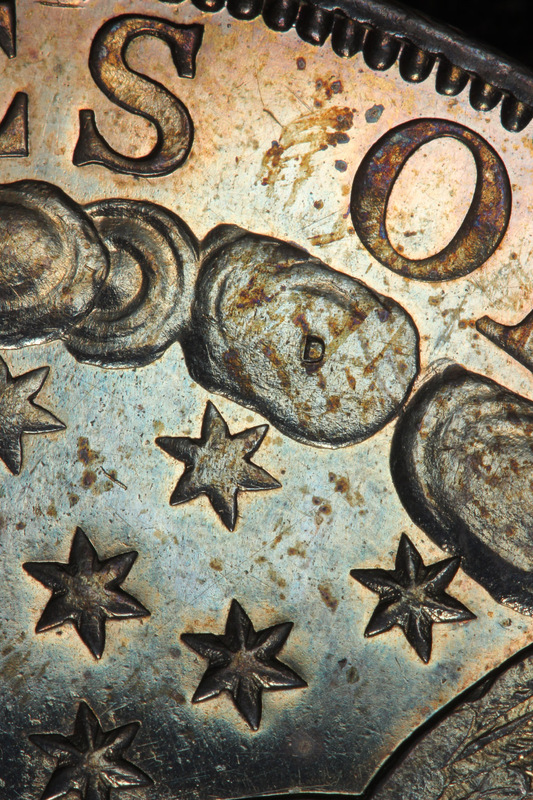 The Pogue coin, graded PCGS Secure AU58+, also was formerly in the Eliasberg Collection. Mint record indicate only 268 $5 gold coins were struck at the San Francisco Mint in 1854. Only eight examples of the Class I Lettered Edge Draped Bust 1804 dollars are known. The Pogue family owns the Dexter Specimen, graded PCGS Secure PR65. A close up of the Dexter "D" in a cloud on the reverse of the Dexter specimen 1804 dollar. Ron Guth, President of PCGSCoinFacts.com (www.PCGScoinfacts.com) states: "The 1804 Silver Dollar is one of the rarest and most popular of all American coins, despite the fact that none were made until 1834 and several were even made many years after that!" The Long Beach Expo will be in the Long Beach, California Convention Center, 100 S. Pine Ave. Public hours are Thursday and Friday, January 29 and 30, from 10 am to 7 pm, and Saturday, January 31, from 10 am to 5 pm. Admission is $8 for adults, $4 for seniors and children aged 8 to 16. However, free admission coupons are available in advance online. "Simply go to our website, www.LongBeachExpo.com, click 'Get Passes,' and enter the special Promo Code, PRJAN15. Then print out the free admission coupon and present it at the show's registration desk," said Long Beach Expo President Cassi East.